There’s probably no greater contrast to be found in the world, than the contrast between the rush and chaos, hustle and bustle of the Indian city of Kolkata and the peace and quiet of the mountain Kingdom of Bhutan. Our morning flight took us away from the millions of people who crowd Kolkata, over and through the foothills of the Himalaya, to the Kingdom of the Thunder Dragon where a mere 700,000 people inhabit the whole country of Bhutan. 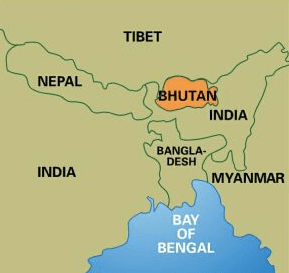 Map showing Bhutan in relation to India, Nepal and Tibet. Unfortunately, we were seated on the ‘wrong’ side of the plane and only caught glimpses of the mighty Himalaya. Never-the-less, just the sight of them is enough to stir the blood and make one anticipate a very different type of experience. We flew in Royal Bhutan’s Airline, Druk Air, which has a distinctive and proud logo depicting the Thunder Dragon. This airline has only a very small fleet and we flew on one of its two Airbus 319s. 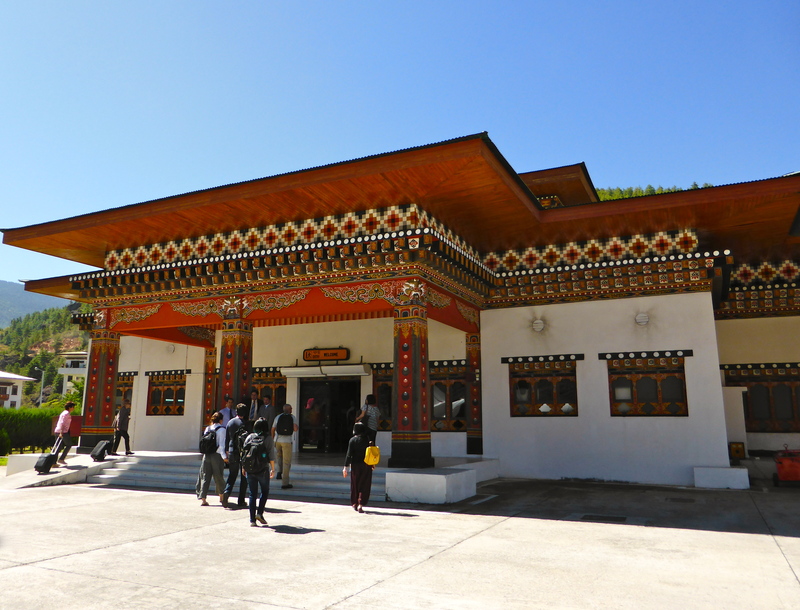 Our destination was Paro, the only commercial airport in the whole country. Pilots have to hold a special license to be able to fly into this airport. 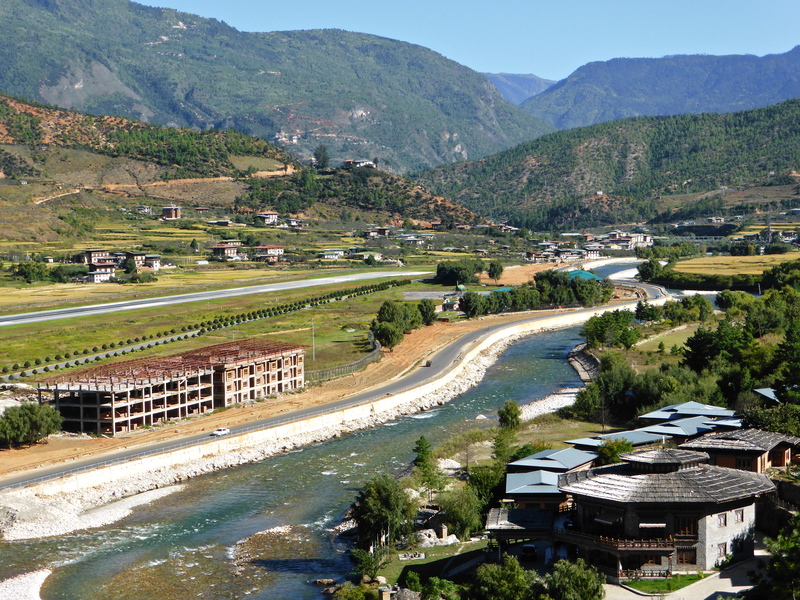 There’s only one airport because the Paro Valley is the only place in the whole country of Bhutan that has a long and flat enough stretch of land to construct an airport! As we banked through the hills, we could just see, far down the valley, a yellow, flatter area of rice farms. And that tiny strip of yellow was our destination; Paro Airport. The approach was quite exhilarating with mountains to the left and right of the wing tips. 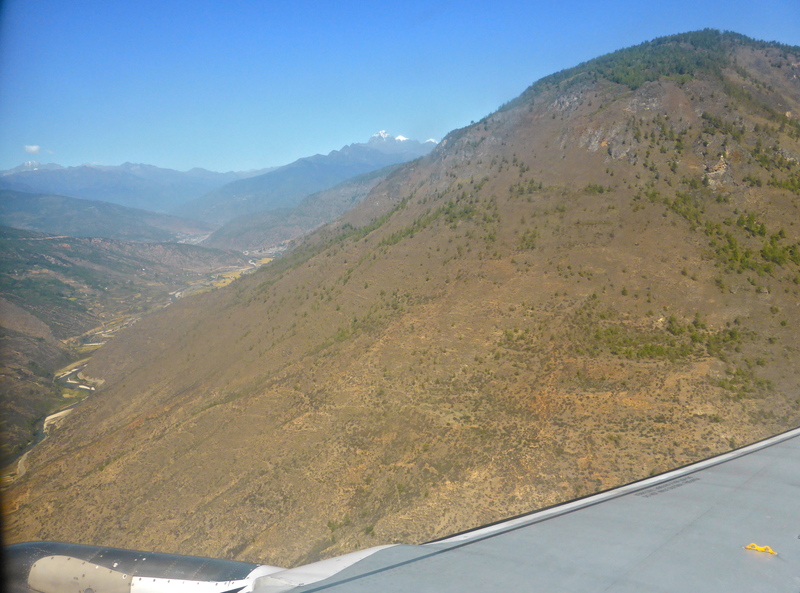 Safely on the ground, engines off, the calm and serenity of Bhutan began to set in. Bhutanese art and style is evident even at the airport terminal. Attention to detail in the art work. No busy highways outside this airport terminal… just a tranquil country scene. 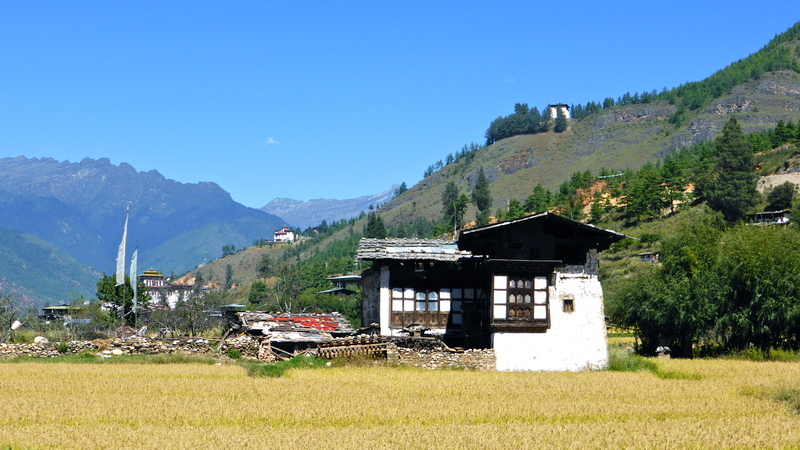 Rice fields and typical farm houses in the Paro valley. Driving up out of the valley, up is the only way to go, we came to a viewing spot. From here we could enjoy the clear blue, unpolluted sky and begin to breath in the pure mountain air as we looked up the valley we had just flown through. 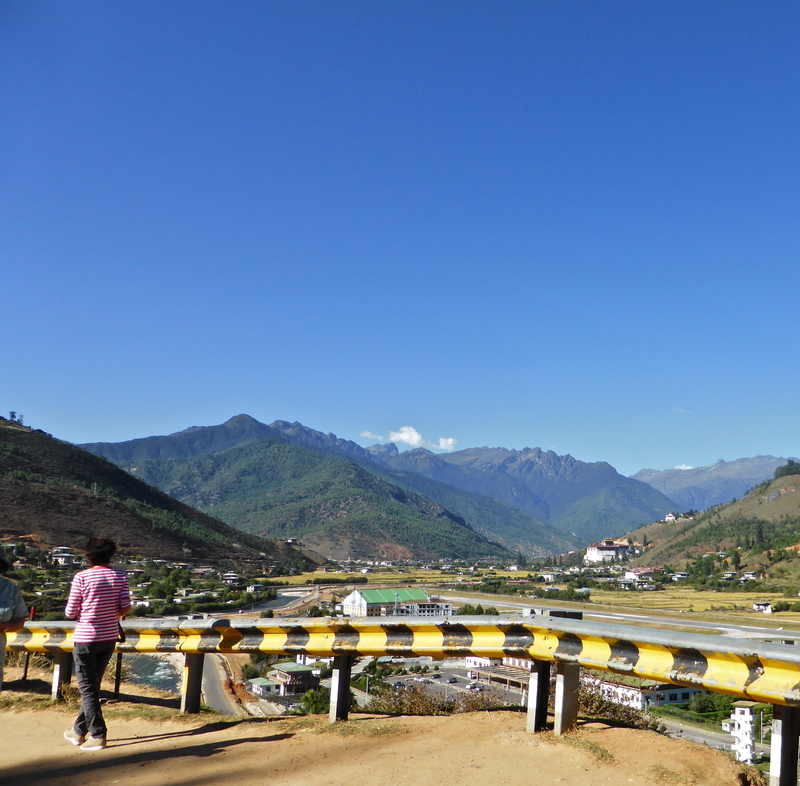 Down in the Paro valley, beside the cold mountain stream and some buildings under construction, was that runway! 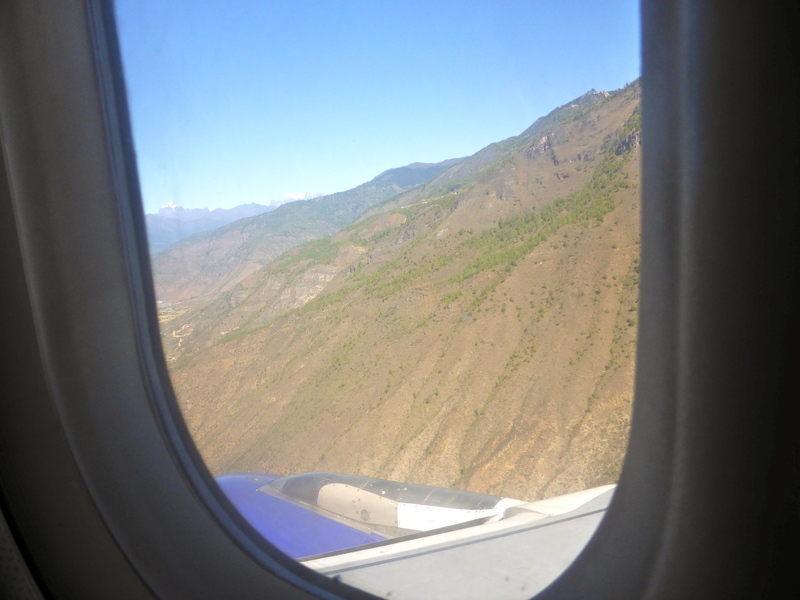 While we were in Paro, we were to experience several times the unusual sight of a plane coming into land below us. Prayer flags are a common sight in Bhutan. One hundred and eight is a significant number to the Bhutanese so those who can afford to do so, erect this number of prayer flags to commemorate the death of a family member. 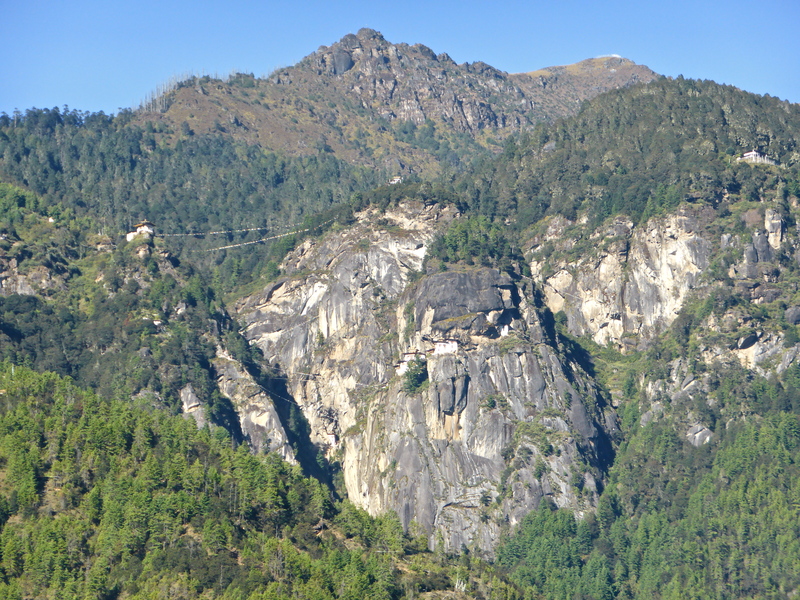 As we drove higher into the hills, we saw, far away across a valley, our first glimpse of the famed ‘Tigers Nest Monastery’, an iconic and much photographed symbol of Bhutan. A closer look through the camera’s tele lens shows just how precariously the monastery is perched on the rocks of the mountain side. We planned to walk up there to visit the monastery later in our Bhutanese journey, but for now, we just viewed it, in awe of those who built it in the first place and of those who still live there today. Throughout the hills there are small farms dedicated to growing the Bhutanese red rice which is a red japonica rice. It is semi-milled which leaves some of the red bran adhering to the medium-sized grains. It takes a little longer to cook than white rice but less time than brown rice. It retains its pink colour, is soft and slightly sticky. As timber is plentiful, it is the basic resource used for building. This simple dwelling, possibly someone’s first home, shows the use of rough sawn planks. 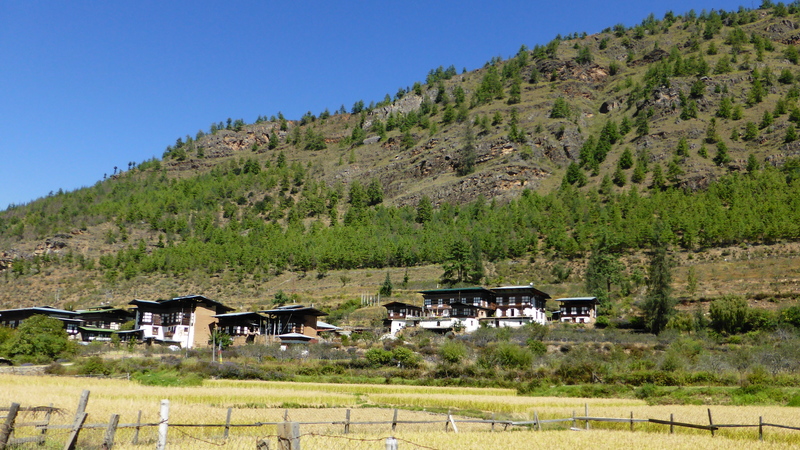 This is the traditional style of house seen throughout the Bhutanese country side. Usually three stories high, the ground floor is used to shelter animals, the second floor is where the family lives and the top floor and roof areas are used to store grain etc. The open style roof area allows for ventilation of the storage. Decorated windows provide a great place to watch the world go slowly by. No rush here. Chillies and jerky hang to dry from the lower windows. A phallus painted on the side of a house is very common sight in the countryside, though not so much in the towns. It’s an ancient symbol of fertility and is said to ward off evil spirits and bring good luck. It comes as a surprise to many western visitors to find this symbol depicted in many different ways not just on houses but in the arts and crafts, especially in the countryside. ‘Gift wrapped’ with ribbons, dragons and snakes, this symbol comes in many guises. A patient Dad carries his sleepy son in a traditional shawl. Not many houses have flower gardens; vegetables usually take priority. Where ever you drive or walk in this country, there is a view down into a valley. And you also need to stop and look up. The snow covered peak of Mount Jhomolhari is impressive. Seeing that is a reminder that Bhutan is bounded in the north by the mighty Himalaya. 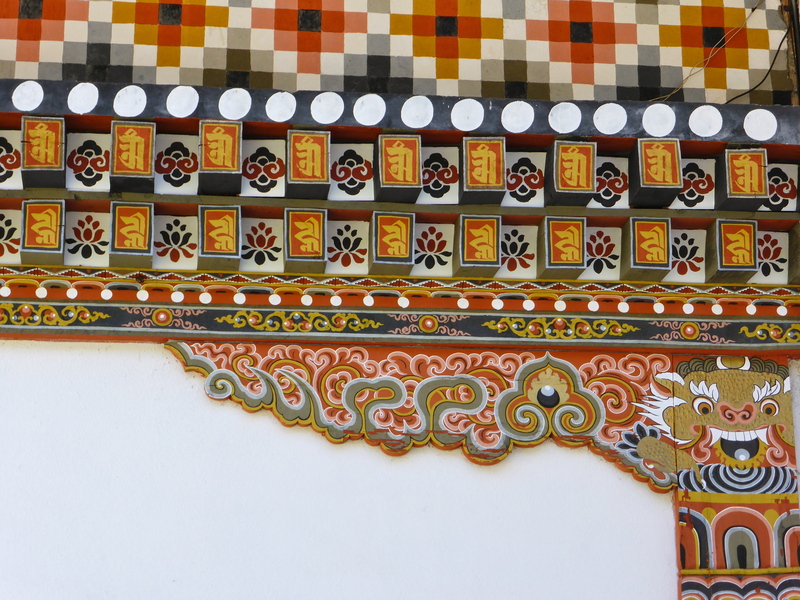 So much beauty – and this was but the start of our Bhutanese sojourn.